He was America’s first sports superstar. He was the gold standard of his sport for more than a decade. He was the first athlete to earn more than a million dollars. His rise from the working-class city streets epitomized the American Dream. He had a big ego, big mouth, and bigger appetites. He ate and drank with reckless abandon. He was loud and vulgar. His womanizing, drunken escapades, and constant police-blotter presence were godsends to a burgeoning newspaper industry. He was John L. Sullivan. Nearly four decades before Ruth donned a baseball uniform, Sullivan ruled as heavyweight champion from 1882 to 1892. Born to Irish-American parents who fled the horrible potato famine that gnawed away at Ireland, the larger-than-life boxer rose from a working-class Boston neighborhood to become the most recognizable man in America. Far from being a bygone, sepia-toned relic, Sullivan’s story is a familiar one. Everything we know of modern sports—the hype machine, the press coverage, the hero worship by fans, the pitfalls of celebrity, the endorsements, the greed and ungodly sums of money, the gambling, the intersection of show business and athletics, and the gossip—all appear in Sullivan’s tale. The man known as the “Boston Strong Boy” starred in theatrical productions, sought political office, owned his own bar, and shilled products for advertisers, activities that all seem commonplace for athletes today. 1. John L. Sullivan was the first American sports hero. If sports are America’s secular faith, Sullivan is not only among the pantheon of athletic gods, he is our Zeus. His decade-long reign coincided with the birth of American mass media, and his oversized personality gave birth to America’s celebrity obsession with athletes. Long before athletes’ private lives became fodder for TMZ, Deadspin, and ESPN, there was Sullivan’s dirty laundry being aired in Richard K. Fox’s National Police Gazette and Joseph Pulitzer’s New York World. 2. John L. Sullivan was the first Irish-American idol. 3. John L. Sullivan modernized the sport of boxing. The last of the bare-knuckle champions and the first of the gloved title-holders, Sullivan was a transcendent figure in boxing history. By insisting on fighting with gloves under the newly developed Marquis of Queensberry Rules, he revolutionized the sport from barbaric, outlawed bare-knuckle fighting into the gloved spectacle we know today. “The Boston Strong Boy” pulled boxing from the back woods onto the front pages. My latest book, Strong Boy, tells the story of the self-made man who personified the power and excesses of the Gilded Age. In vivid detail, the 368-page book offers readers ringside seats for Sullivan’s epic brawls, such as his 75-round bout against Jake Kilrain and his cross-country barnstorming tour in which he literally challenged all of America to a fight. 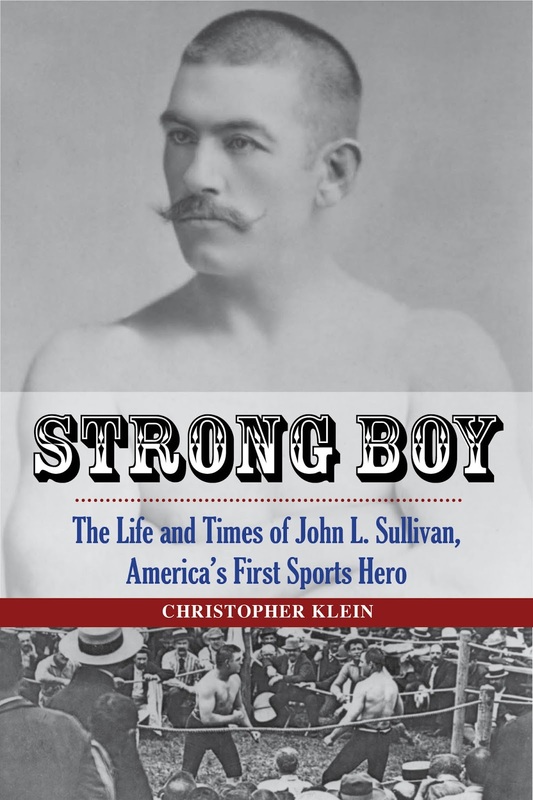 Strong Boy also chronicles Sullivan’s battles outside the ring with a troubled marriage, wild weight and fitness fluctuations, and raging alcoholism. While he struggled with personal demons, his life story is ultimately a redemptive one. Even those who aren't boxing fans will be entertained by Sullivan’s incredible exploits both inside and outside of the ring as they learn about America’s sports-obsessed culture, the seedy underbelly of Victorian society in the Gilded Age, and the rise of Irish America in the latter 1800s. Copies of Strong Boy, which will be available November 5, 2013, can be ordered online at Indiebound, Barnes & Noble, and Amazon. 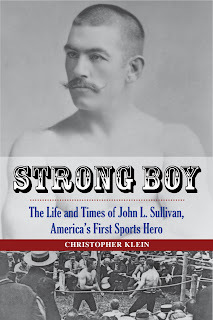 For more on John L. Sullivan, visit the Strong Boy web site at www.strongboybook.com and keep watching this blog.